Jewels of Ascension wrapped-stone jewelry, set in unique designs, features select rough and polished stones with complimentary colors and textures. 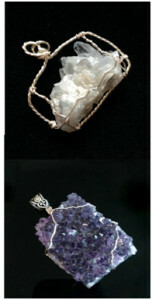 Designer Grace Star is a fine artist who brings a deep love of color and composition to her stone poetry. She intuitively designs each creation so that it carries a beautiful energy for the person wearing it. These energies include love, protection, prosperity, health, and creating the life you wish to have. She keeps the pricing modest, so the stones can bring the best good to as many people as possible. Grace is an intuitive reader and author. Her book “Treasure Chest” is an inspirational read about the power of gratitude and manifestation.